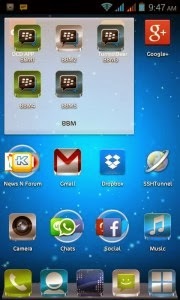 Have you ever imagined more than one BBM app runing on your android device? The future of this operating system is limitless. Google has the futuristic ambition and the funds to take Android to unprecedented heights. In many areas — such as predicting what users will do next (for instance, Google Now knows that in the morning you're getting ready for work and will tell you about the traffic) — they've already surpassed Apple. The point is that android recently introduce an app called BBM3, this great application can help your android device run more than one BBM app on your android device. Do you know that even the original creator of BBM can't use dual bbm on the blackberry device, but Android devices have just broke the embargo of using only one bbm on your android device with the use of BBM3. ==>Wait until it finishes and you will have 2bbm running on one android device. Note:- Make sure you 've the original BBM installed on your android device. This application is only supported in an android device of version 4.0+. I installed BBM3,it works fine but as a buisnessman I want to have it for a third time or even fourth.How do I do this.